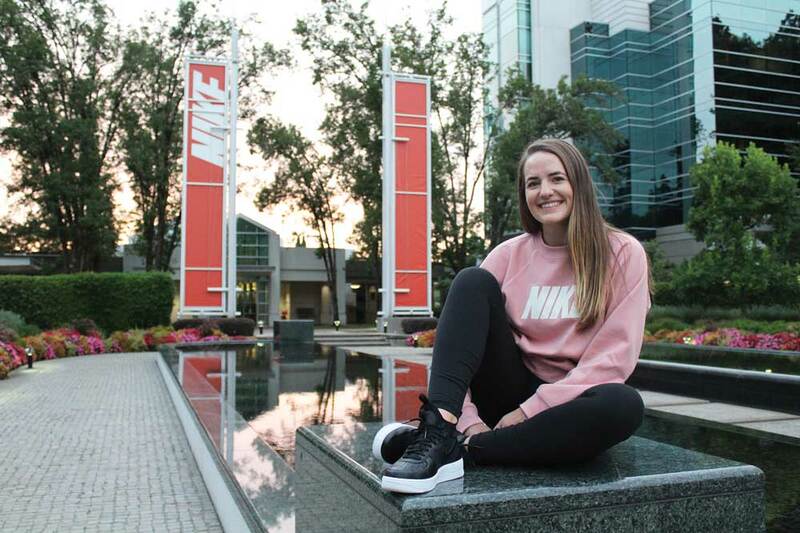 UM student Ellie Hanousek spent her summer interning at Nike Inc. and already was hired to return as a financial analyst at the Fortune 500 company in fall 2019 after her senior year. This past June, UM’s Ellie Hanousek spent 12 weeks at Nike Inc. helping the company fine-tune its engine. As a current student in the College of Business, Hanousek studies marketing and digital marketing, and the Nike internship allowed her to apply what she’d learned in the classroom to the inner workings of one of the most powerful companies in the world. Her project focused on streamlining month-end reporting for Nike’s Global Operations and Tech Finance Team. To make that happen, she met with 14 of the company’s finance managers and analysts to understand where improvements could be made. The information she gleaned from the interviews allowed her to create one standardized process, which she automated using a bot team. She also set up a data visualization software program to help Nike gain deeper insights into its finance data. “A lot of the project was consolidating information and trying to come up with best practices,” Hanousek says. Her experience at UM perfectly prepared her for the internship in a multitude of ways. 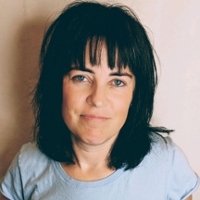 In an Information Infrastructure class taught by Professor Cameron Lawrence, for instance, she developed the skillset that allowed her to ferret out some of Nike’s inefficiencies and develop solutions. In addition, Hanousek’s education at the College of Business provided her with a necessary international perspective. She studied abroad in New Zealand, where she learned about sustainable business practices. In 2016, as part of the Kakehashi Project grant, she participated in a weeklong guided tour of Japan, where she learned about Japanese culture, history, politics and economy. Both those experiences prepared her to work with a global team of professionals. It’s no coincidence that Hanousek landed at the Fortune 500 company for an internship. Nike’s COO is Eric Sprunk, an alumnus of the UM College of Business. He established a recruiting program with the college called Project Shoelace, which provides internships to UM business students and opens the door of opportunity for a career at Nike. But Sprunk’s ties with the College of Business are just one example of the natural reciprocation process that happens between the College of Business and its alumni. Since its inception in 1918, the college has seen 20,000 alumni go forth in the world to take management positions with global powerhouse companies such as Microsoft, Nike, KPMG and Boeing and launch careers as accountants, IT consultants, marketing professionals and entrepreneurs – work that bolsters local economies in Montana and beyond. Its list of notable alumni is extensive – besides Sprunk, there’s Columbia Sportswear CFO Jim Swanson and former Microsoft CFO John Connors, to name just a few. 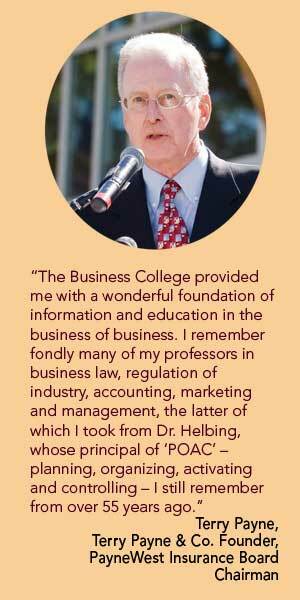 This year marks the centennial anniversary for the College of Business – and there is plenty to celebrate. Over the years, the college has built a thorough, well-rounded educational experience featuring global travel opportunities, internships, hands-on and project-based classroom learning, and applied, cutting-edge techniques taught by award-winning instructors. The programs are fortified both by strong relationships with alumni and by strong networks with professional companies across the world. UM’s business college is the oldest AACSB-accredited business college in the state, and it has come a long way since its inception. It sprung out of a program solely focused on secretarial work, and in 1917 expanded its offerings to areas such as elementary accounting, commercial law, court reporting, business organization, real estate and insurance. 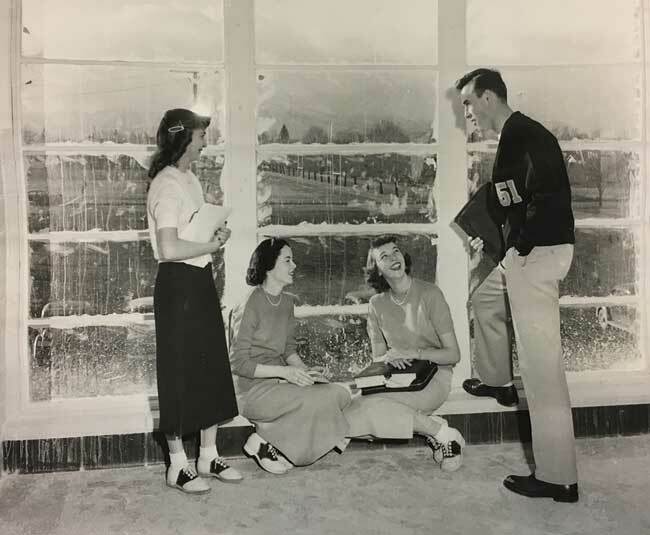 At first, enrollment was low because of the war, but in 1918, when the School of Business Administration was established, it saw the highest enrollment of any college at UM. It continued to expand as soldiers returned home and chose to go into business careers – and it continues to this day to be a high-enrollment college. 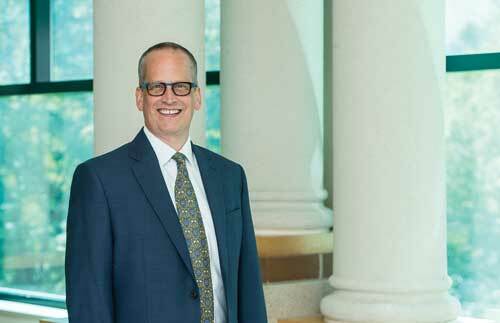 Chris Shook, the Sprunk and Burnham Endowed Dean of the College of Business, says one of the main reasons the college continues to enjoy a glowing reputation is that students get real-world instruction from the beginning. Shook has experience teaching abroad, and he recalls being ribbed for how much American education is focused on theory rather than application. UM’s College of Business bucks that stereotype. The College of Business now offers six majors, six certificates, three graduate degrees and a minor. Majors consist of accounting, finance, international business, management, management information systems and marketing. Graduate degrees include a Master of Accountancy, Master of Science in Business Analytics and a Master of Business Administration. The MBA – the only MBA program in Montana – has grown by 30 percent in the past few years. It’s one of the more affordable master’s programs in the country, and as of this year doesn’t require students to be on campus. Accounting is one of the college’s flagship programs and is highly successful in terms of job placement, with about half of the college’s graduates staying in state and half leaving for work out of the state. Students take the CPA exam before they enter the workforce, which gives them a head start. 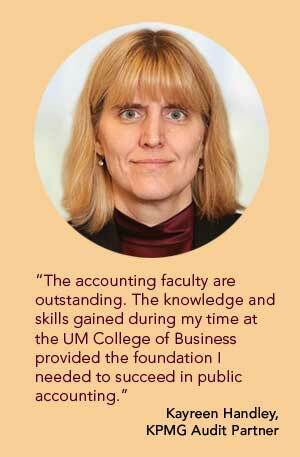 It’s one of the main reasons the “big four” accounting firms recruit from UM. The process of preparing students for accountancy careers (and the exam) has a lot to do with the relationships the program builds with outside companies. 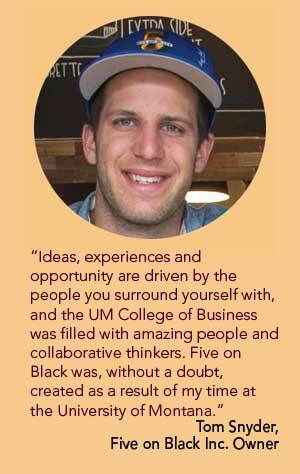 For instance, KPMG, a worldwide accountancy firm, selects 30 schools with whom to partner, and UM is one of them. The firm devotes one of its partners to each school, and that relationship helps build a bridge for students as they transition from school to career. 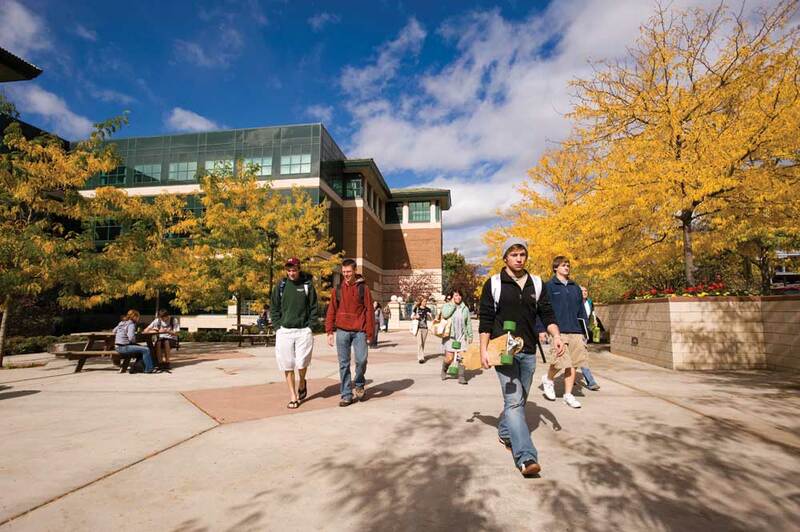 Working with companies in Missoula and surrounding areas is key to UM’s business education. Students in David Firth’s consulting class, team up with Advanced Technology Group, a “quote-to-cash” company that works with integration and automated management of end-to-end business processes on the customer side. They form consulting teams and meet throughout the semester with ATG consultants to execute a project for the company. ATG is one of several companies the college works with to facilitate projects in every field of study. Students in marketing must present a project at the end of the year using real data, real companies or organizations, and real problems coupled with real solutions. Historically, marketing was an area of study that focused primarily on presentation and building relationships. The business college requires students also to understand the underlying concepts and data from which they’re drawing and use that to tell a broader story. Central to the college’s successes is its long list of beloved instructors, who must constantly keep up on ever-shifting technologies and industry trends. Jakki Mohr, Regents Professor of Marketing and the Poe Family Distinguished Faculty Fellow, is a prime example of how the college consistently stays on top of its game. Mohr, who’s been at UM since 1997, recently received the Montana Professor of the Year Award from the Montana Ambassadors for her award-winning research and thought-provoking teaching on the unintended consequences of technology and the challenges companies face when commercializing breakthrough innovations. She also works with the Marketing Science Institute, a nonprofit that helps Fortune 500 companies set their agendas and stay up to speed on current technologies. And that kind of engagement with the world outside the classroom keeps the college on the front lines. According to Mohr, the College of Business succeeds because it doesn’t insulate itself from the outside world – it’s responsive to opportunities. Five years ago, Tim O’Leary, a UM business alumnus who runs a data-driven marketing agency in Portland, Oregon, told the college he could hire a lot more UM students if they had more statistical and quantitative chops from a marketing perspective. Mohr and her colleagues took that comment to heart. The college doesn’t just help prepare students for careers, it helps them seed their own ventures right in the classroom. Missoula is chock-full of businesses and organizations started by College of Business alumni. One popular Missoula business that sprung from the college is Big Dipper Ice Cream. Owner Charlie Beaton, who graduated in 1991, studied at the College of Business, where he took entrepreneurship and marketing classes. Beaton isn’t your stereotypical businessman. He grew up playing in punk rock bands and wanted to find a way to own a fun business that fit his laid-back personality. He says he found some answers in a class taught by Dan Callahan, a marketing professor at the time. In an entrepreneurship class taught by Paul Larson, Beaton wrote the business plan for Big Dipper. He based it off a book Larson wrote called “Montana Entrepreneur’s Guide,” which Larson used as a textbook for the class, and which provided state-specific details on financing, trademarks and legal issues. Several Missoula businesses, from restaurants to digital marketing companies to ski manufacturers, got their start as part of the John Ruffatto Business Startup Challenge, a statewide business plan competition for college students. The Startup Challenge originated in 1989 at the College of Business and is now an annual event, hosted in collaboration with Blackstone LaunchPad, where students can win thousands of dollars in cash prizes and secure startup funding. The challenge also allows students the opportunity to network with venture capitalists, early stage investors, investment bankers, economic developers, corporate executives and successful entrepreneurs. 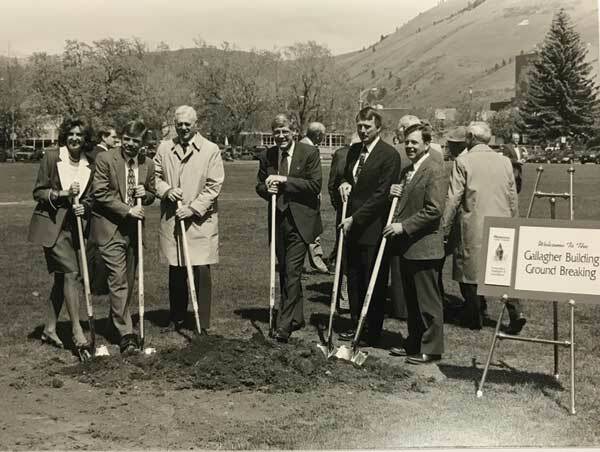 The College of Business centennial celebration, which begins Friday, Sept. 21, will feature food and drink from several businesses that had their start at the college, including Big Dipper, Five on Black, Big Sky Brewing and Market on Front. Activities include a golf scramble at the UM Golf Course, hikes to the M and a tour of the William and Rosemary Gallagher Business Building. 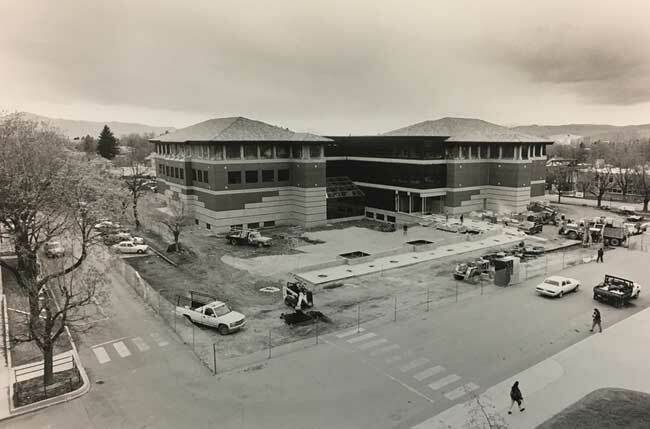 The Gallagher Business Building is a symbol of how far the college has come and the kind of drive from faculty, staff, students and alumni it took to get there. 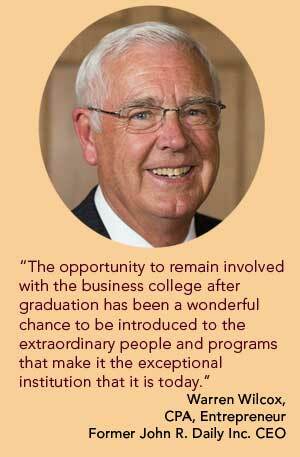 Larry Gianchetta, who spent 30 years as dean of the College of Business (42 years in all), saw the materialization of both the Gallagher Business Building and the Harold and Priscilla Gilkey Building during his tenure. He recalls meeting the Gallaghers (William is a graduate of the business school) and being amazed at what an impact they had on the school when they offered a million dollars to build a space for the college. Alumna Jena Gardner, who grew up in the Bitterroot and attended UM’s business college, is a prime example of a creative thinker who has made positive impacts on the world. Her lifelong love of travel became her career when, in 2002, she started JG Worldwide, a multinational New York City-based company for which she is president and CEO, which provides an expansive portfolio of services to the travel and tourism industry. In 2008, she co-founded The Bodhi Tree Foundation, a nonprofit organization dedicated to supporting environmental and humanitarian efforts related to travel and tourism sustainability. Her glowing reputation has made her a sought-after international keynote speaker and consultant on business innovation. 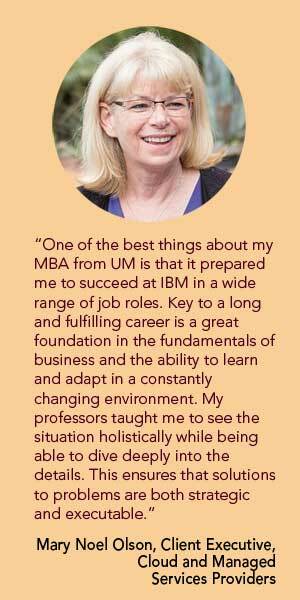 And like so many alumni before her, Gardner can trace the roots of her global success back to the hallowed hallways of UM.